Carl Andre’s large-scale sculptures are primarily compositions, definitions of what they should be (an analogy with Claude Rutault can be drawn, even if Andre does not go as far in the direction of methodical protocols). They were conceived on paper, to the point of templates, then assembled with locally-available materials; at the end of the exhibit, they were disassembled and the materials, be it wood or brick, would return to their original state. The artwork could be seen not as an object, but as a unique, temporary, experience, though it could be reproduced at another time, in another place, with similar materials, and the same schematics. Alas!, nowadays, the art market and museographical constraints prevent such freedom of the ephemeral: Andre’s sculptures are inventoried, made permanent, disconnected from the local, from any original state, deeply changed by canonical vitrification. Therefore, the “raw” artworks do not catch the eye of the visitor as much as the most “precious” ones, made of graphite and shining copper (44 Carbon Copper Triad, in the foreground of the view shown above), of steel and aluminum tiles in checkerboard pattern, or of aluminum ingots piled up in a line. Moreover, Carl Andre’s production was always meant for the visitor to interact with it: to touch, to peruse, to navigate around and amidst the artworks, to experience and feel one’s body in relation to their actual size, structure and texture. Alas!, again, and for the same reasons, only six floor compositions at ground level remain accessible at the MAMVP (it was the very least they could do, although the conditions strictly stipulate it cannot be barefoot, or with high heels, or with wet soles…). Other artworks, originally conceived as forests of blocks varying in size, made of concrete or wood, where the visitor would perambulate, are now categorically off-limits and a brigade of watchful guards prevents any incursion. For example, Lament for the Children has to be look at from a distance, and therefore only elicits a cold, detached, intellectual response. 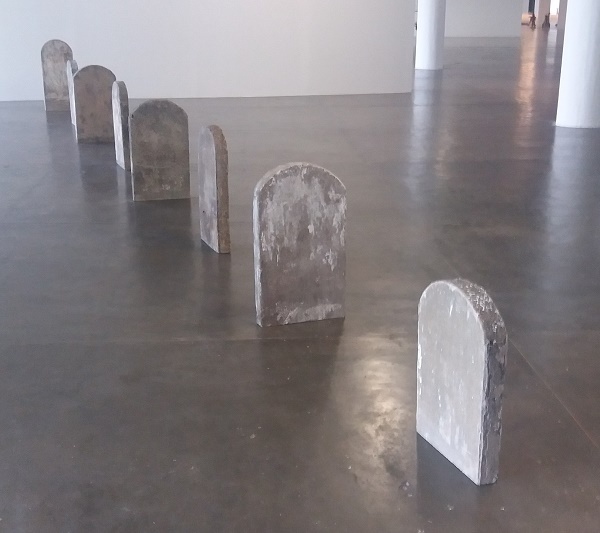 On the contrary, in 1976, in what would become PS1, to be able to walk in the flagstone courtyard surrounded by a hundred concrete blocks (initially water tower bases) must have generated feelings of fright and melancholy, like in a cemetery (the tombstone as the original sculpture). Even if Carl Andre’s work remains powerful in itself, all these little things skew the artist’s intentions, and likely distort the sensations that the visitor should be able to experience. It was probably impossible to avoid, but it is a shame nonetheless. Maybe this is the reason why Andre hasn’t made large-scale sculptures in recent years, only miniature ones that he doesn’t sell, but rather gives as gifts to his friends.